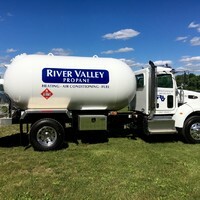 When you need propane delivered to your Guilford home, you can rely on River Valley Propane to provide fuel brought directly to you. Call one of our customer support lines and set up a convenient appointment for delivery. We coordinate with the homeowner, sub-contractor, general contractor, building or landscape architect or engineer in order to properly spec appliance & tank sizes and placement. We coordinate with the builder to provide fuel tank and gas supply system sizing, installation, and continuous fuel supply throughout the construction process. When you need propane delivered to your home, you can rely on River Valley to provide fuel brought directly to you. Call one of our customer support lines and set up a convenient appointment for delivery. © 2019 River Valley Oil Service, Inc.